A couple of weeks ago I was out shopping for a gift for my Sister in Law, Jennifer. Since we live many miles apart, sometimes shopping can be a challenge because I don't really know what she needs. Often because of this, we give each other gift cards. I know for myself, I love receiving gift cards and hope that Jennifer will too, so that way she can pick out something that she really likes for her special day. As I was shopping at Macy's I came across this flowery gift card. It's hard to tell in the photo but it has a lot of gold in it that shimmers when you move the card. I purchased this gift card for Jen and then used it as my inspiration for the birthday card I made for her. This is not my usual stamping style but I was inspired to stamp this way because the card had a lot going on with all the flowers and colors and shimmers of gold. I used the Celebrations Duo Textured Impressions folder to emboss the word "Happy" as the central focal point of the card. The "Birthday to You" came from the coordinating Happy Celebrations stamp set. 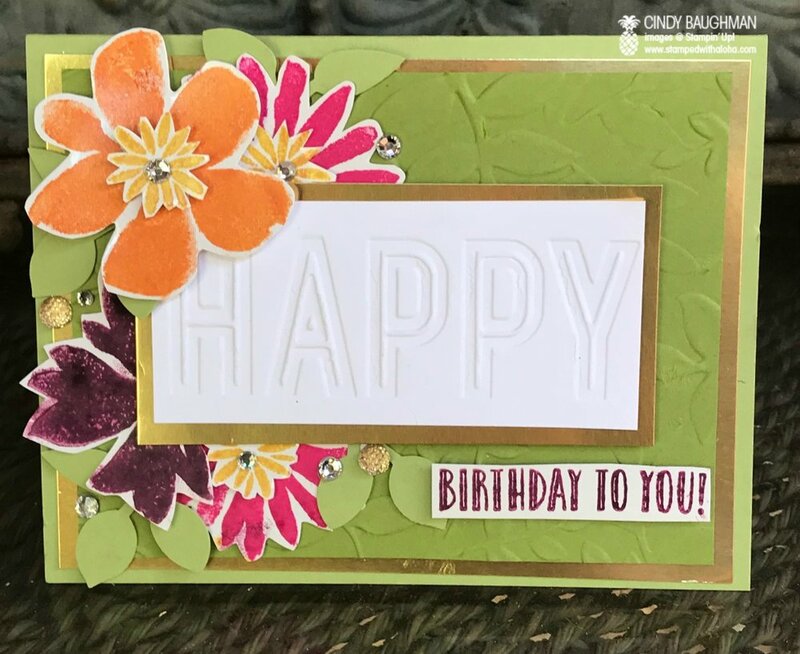 I then fussy cut a bunch of flowers on glossy paper from the Blooms and Wishes stamp set and embellished galore with rhinestones and gold faceted gems. 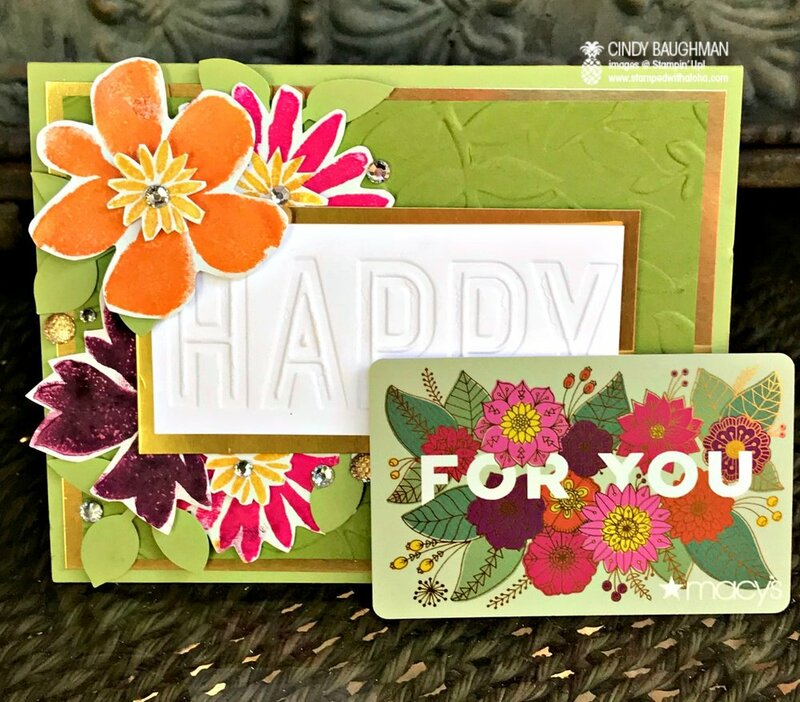 There was an Old Olive textured base that was created with the Layered Leaves dynamic embossing folder and a lot of Gold Foil paper to make this card shine. The leaf punch made it easy to add leaves behind the colorful flowers. I spoke with Jennifer this morning to wish her a Happy Birthday and she didn't mention receiving my card yet. I hope it arrives today so that she will receive it on her special day. If not, the surprise is certainly ruined if she reads this post first, but that's ok! Either way she will know that she is being thought of today, on her very special day! Happy Birthday Sis! I hope you have a day that blooms with blessings and may all your birthday wishes come true.